South African franchisee, Siyaghopa Trading Group, will be opening its first Popeyes Louisiana Kitchen quick service restaurant (QSR) in Sandton City, Johannesburg on 13 July 2017. 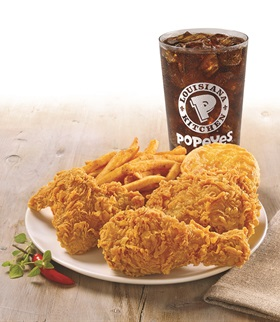 Founded in 1972 in New Orleans, Popeyes is an iconic American brand and a global player in the fried chicken segment of the QSR industry, having carved a niche in the market with its Louisiana-style cuisine. Its restaurants span more than 25 countries, with South Africa being the latest to join the fold. The brand is founded on a 300-year old culinary tradition, which incorporates a fusion of cooking styles, spices and ingredients, derived from African, European, North American and Native American cultural influences. Based on restaurant unit counts, Popeyes is currently ranked as the world's second largest QSR chicken concept. SANHA Comments: The Sandton store will be SANHA certified, Allah willing. Contact our Helpline for further developments.